The very first Bible scripture on faith that comes to mind for many Believers is probably Hebrews 11:1. This Bible verse reads, “Now faith is the substance of things hoped for, the evidence of things not seen.” Without faith we cannot be saved and faith is essential to the Christian walk. So let’s take a stroll through the Bible and touch on some of the facts and examples of faith. Faith is something that you cannot see, but it is there. It is a substance. It is something so strong that people will lay down their lives for it. Think of early Christians being persecuted, put to death because they would not denounce their faith in the Lord Jesus Christ. Martyrs from Steven in Acts to people like Corrie Ten Boom and her family, and scores of Christians we will never know on this side of glory paid the ultimate price– their very lives. Napoleon Bonaparte is recorded in history as being one of the most powerful leaders. I remember hearing a quote once where he said something to the effect that he could control masses of people but he had to do it by force, threat, and superior strength. But he knew that there were scores of followers of Christ who had never seen God but out of love and devotion (not brute strength) would gladly have laid down their lives. That was amazing to him. So here are some Bible verses about faith. We’ve already touched on Hebrews 11:1. Hebrews 11:6 But without faith it is impossible to please him; for he that cometh to God must believe that he is, and that he is a rewarder of them that diligently seek him. Faith is linked to our very salvation. If you want to be saved, you must first believe that God exists and that He provided His only begotten Son, the Lord Jesus Christ, as our sin payment. We in faith must place our trust in Jesus Christ. The very first reward He gives those who seek him is salvation. Ephesian 2:8-9 For by grace are ye saved through faith; and not of yourselves: it is the gift of God: Not of works, lest any man should boast. 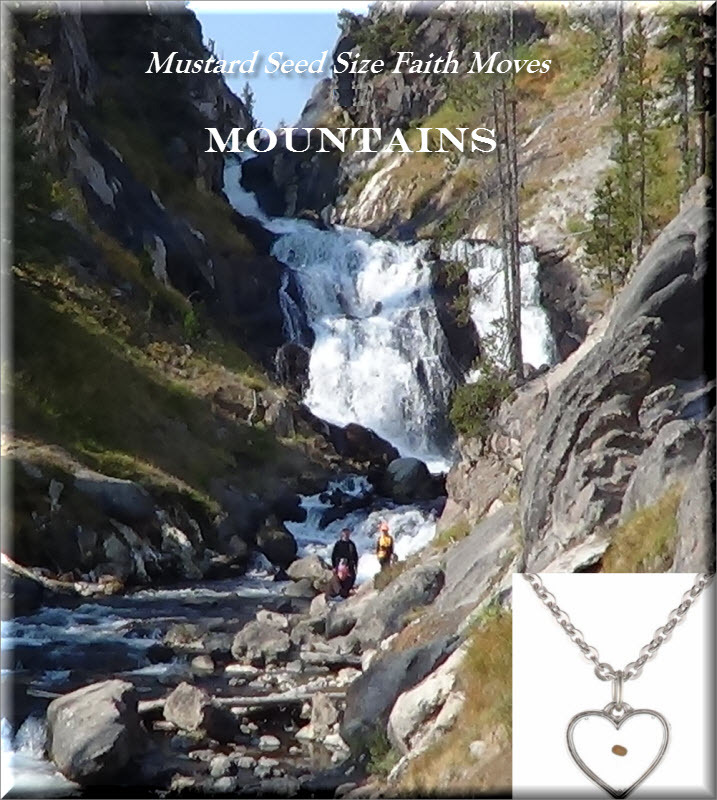 Matthew 17:20 And Jesus said unto them, Because of your unbelief: for verily I say unto you, If ye have faith as a grain of mustard seed, ye shall say unto this mountain, Remove hence to yonder place; and it shall remove; and nothing shall be impossible for you. By faith nothing is impossible. That is an amazing statement, but TRUE. There are situations in people’s lives that only by the intervention of God and the prayers of the saints, would never have changed. There are times when someone was protected in a terrible accident. There are instances where people get saved after years of other believers praying for them diligently. And even physical mountains have been moved by faith. There was a church in the Appalachian Mountains that had a parking problem. With only a small parking lot by the church, the members were having to park out on the side of the road on Sunday mornings. The church parking lot couldn’t be made any larger because a mountain sloped right down to the foot of the existing lot. So the pastor began praying and asking God to move that mountain so they could extend the parking area. The people began to pray the same thing. The cost to excavate away the hillside was way beyond the budget of what the church could afford. So they continued to pray. They claimed this Matthew 17:20 verse and told the Lord they believed he could move the mountain but there was no way they could physically do it themselves. Then one day the pastor was at the church and one of the county road supervisors stopped to talk to the pastor. He said that the county needed a whole lot of clean fill. Someone had remembered the church’s situation and had suggested that the county might be able to get the needed fill from the mountain that was currently occupying the church property. The county offered for FREE to come and carve back the hill side and haul away the dirt, rock and other material, leaving a new parking area behind. What an answer to prayer! And faith that can move mountains! Moving on here, some more verses on faith include how it affects your attitude: James 1:3 Knowing this, that the trying of your faith worketh patience. And finally I would like to point out that faith is credited to Abraham in Genesis 15:6. But here it is referred to as belief. Genesis 15:6 And he believed in the Lord; and he counted it to him for righteousness. Old and New Testament believers who changed history through their faith would include: Noah who’s obedience to build the ark saved his family (and even us) from destruction in the flood; Paul who’s faith enabled him to be inspired to write a tremendous part of the New Testament; Abraham who was told to get up and start walking and God would tell him when to stop and he did it; Issac who had so much faith in God’s guidance of his father that he allowed himself to be bound on an alter as a sacrifice; David who’s faith in God’s Word (not to touch the anointed king) kept him from reaching out and killing Saul; Rahab who protected the spies and saved her household from destruction; Mary who believed the angel Gabriel and Joseph who trusted God even when all of the town had branded he and Mary in their minds; the shepherds who believed in the angels message and acting on faith when to see the Christ child. And on, and on, and on I can go. And so Bible verses about faith should permeate our lives. They should challenge our walk. They should inspire us to “attempt great things for God and expect great things from God”. Without faith it is impossible to please God. Faith in God is against our human nature. But in our flesh we can believe in science, dead wooden dumb idols, and on and on. So live on the side of faith and let God credit it to you for righteousness.